Video Motion Analysis – New on SimBucket.com! 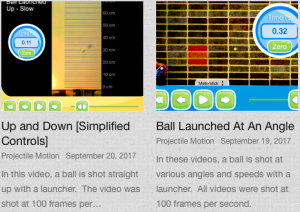 We are pleased to announce “Video Motion Analysis“, a new set of apps on www.simbucket.com. Each app features one video shot with a high-speed camera. Students can scroll through each frame and take careful measurements. Some of the apps contain more advanced plotting, graphing, and analysis tools so that students can collect, plot, and analyze the data directly within the app. We tried the “Ball Launched At An Angle” videos today with our students. Using the graphing and slope calculation tools, they were quickly able to determine that horizontal acceleration is always zero, and vertical acceleration is always 9.8 m/s² downward, no matter which videos they selected for analysis. We are continuing to shoot video, and hope to have many more videos available for analysis over the coming months. 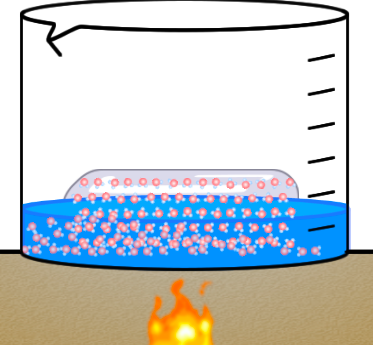 If you have a physics lab that you do with your students and would like us to shoot video, please let us know. We will do our best to recreate it for you and make it available on www.simbucket.com. The new Video Motion Analysis section can be found on the www.simbucket.com homepage, or via the following direct link.